There's still nine days left until Christmas, which means to still plenty of time to do some online shopping. 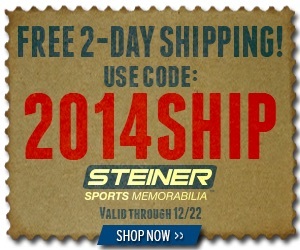 From NOW until December 22, 2014, Steiner Sports is offering FREE TWO-DAY SHIPPING on all orders. Just use promo code 2014SHIP during checkout. 1) Visit Steinersports.com to see their current promotions and search for the items you want. 2) Once you are done shopping, click CHECKOUT. 3) If you have a Steiner account, enter your email address and password. If DO NOT have a Steiner account, enter your email address and select CONTINUE AS GUEST. 4) Shipping and Information. Input ALL your shipping information, select your shipping method and click NEXT. You will be directed to Billing/ Payment Information. 5) Billing/ Payment Information. Input promo code 2014SHIP in the promo code box along with your payment information. 6) Click on SUBMIT AND REVIEW. You will be taken to Order Review. 7) Order Review. Submit your order and you are good to go! Enjoy the savings! Visit Steinersports.com to take advantage of this great deal.